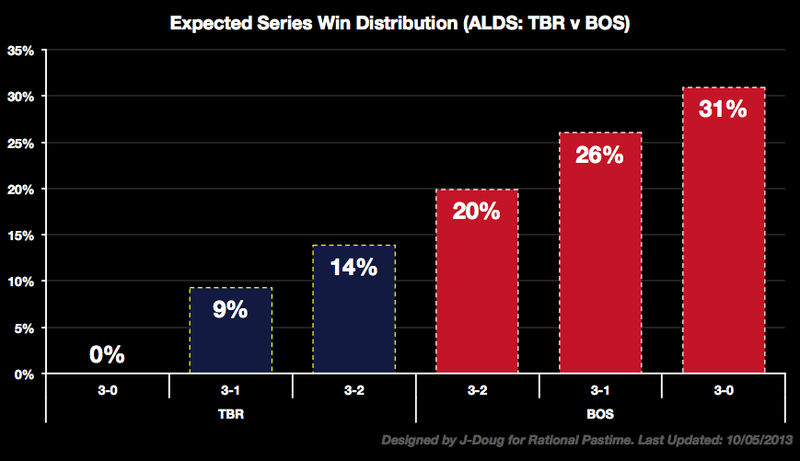 One day after the first full slate of League Division Series action, the Boston Red Sox reclaimed their World Series probability league closely trailed by the Detroit Tigers. 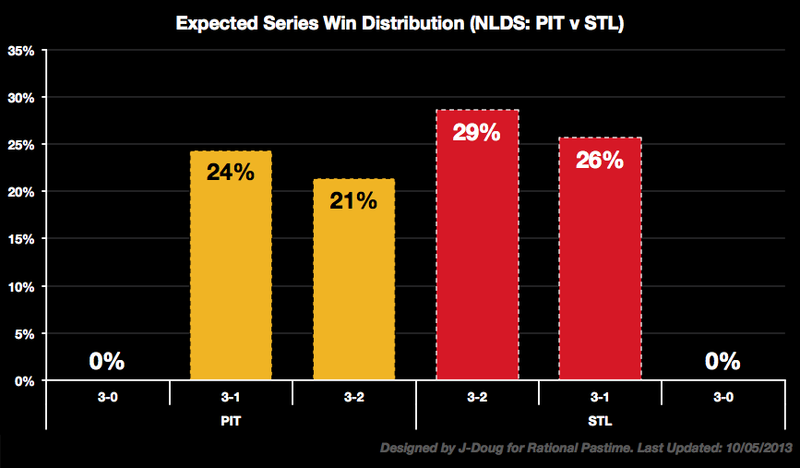 The Pittsburgh Pirates and Atlanta Braves resurrected their prospects as the St. Louis Cardinals and Los Angeles Dodgers got a dose of postseason reality. 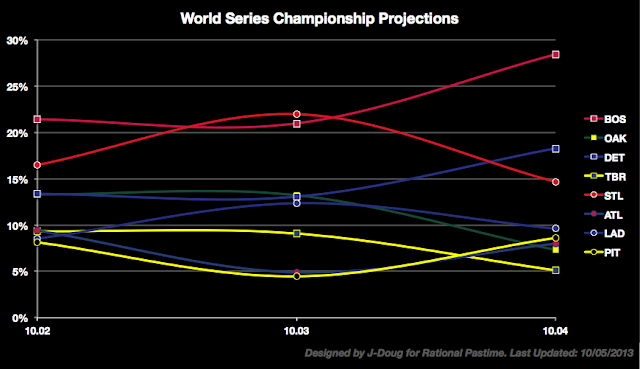 Meanwhile, the Oakland Athletics and Tampa Bay Rays are facing steep odds to advance to the ALCS. The picture is bleak from the standpoint of the Tampa Bay Rays. 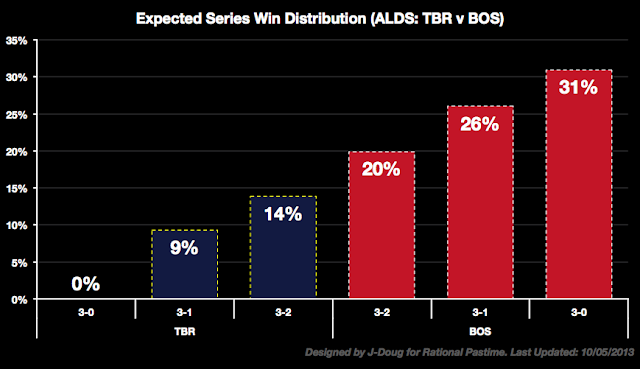 Having lost a comedy of errors to the BoSox, Boston enjoys a 77% chance of advancing to the ALCS, and every possible Red Sox victory is more likely than every Rays victory. 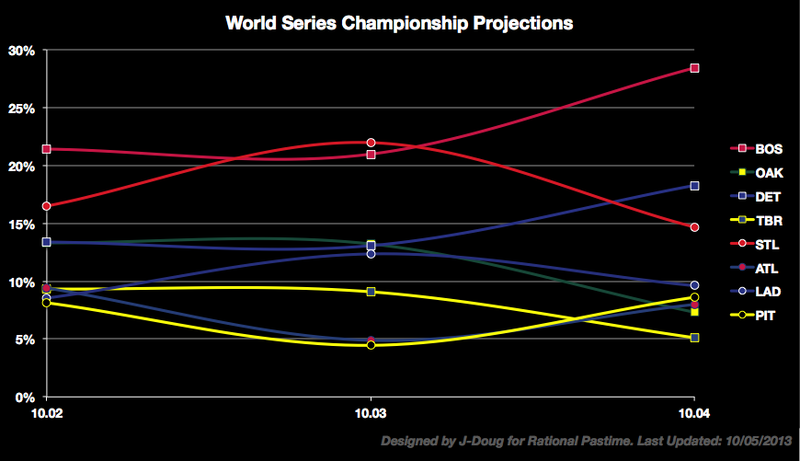 The projection is now Red Sox in three. 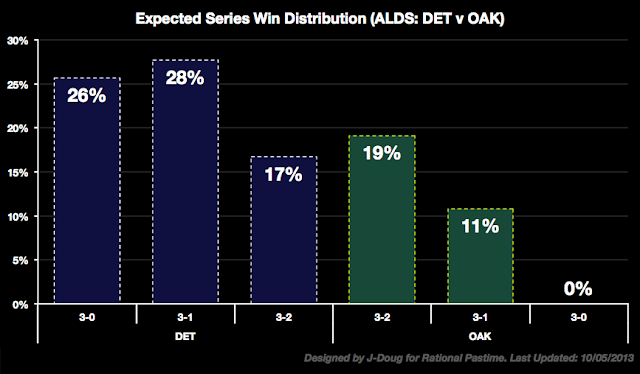 Despite their own Game 1 loss, the A's are in better shape than Tampa Bay. Oakland may not be likely to advance, but a 3-1 Athletics victory is still more likely than at least one other pro-Detroit outcome. 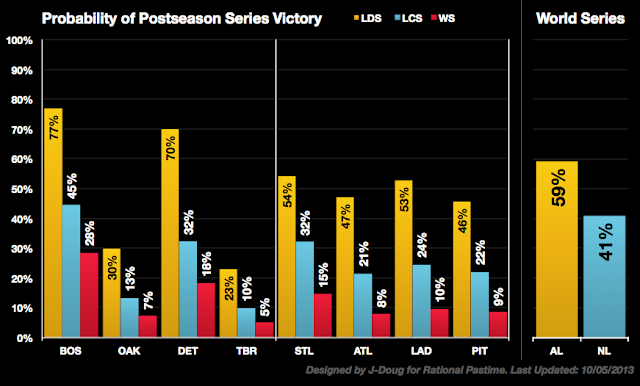 Nevertheless, the system now picks Detroit in four. 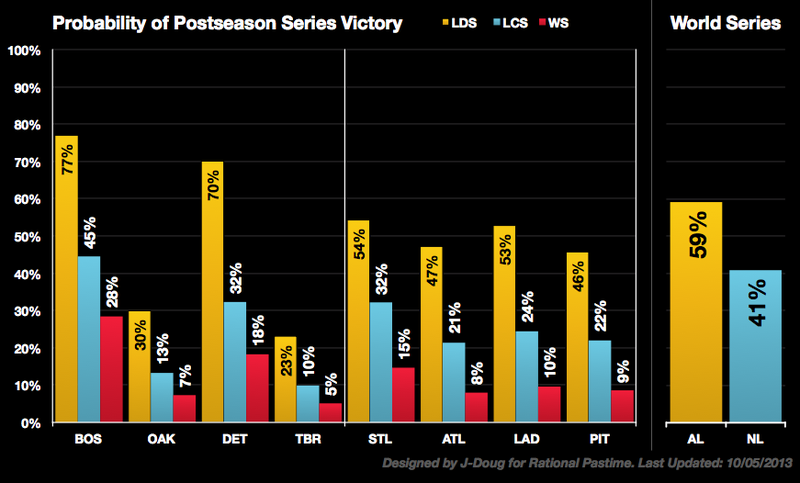 In the NL, the series are all even--but not so much their chances of advancing. The Cardinals enjoy a slight edge over Pittsburgh with the system expecting a St. Louis victory in five games. Finally, while the Atlanta Braves recovered in Game 2, they are still less likely to advance than the Dodgers. 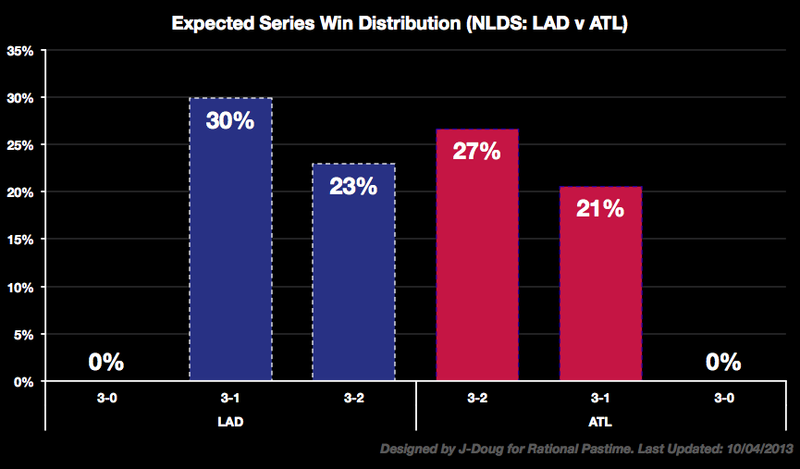 The system now picks the Dodgers in four. With their blowout victory, the Red Sox extended their lead in the rating system, while St. Louis fell back into third. Check back tomorrow to see how the results of today's games affect tomorrow's October prospects.